Do you use Twitter or other social media to stay up to date with the latest happenings? With the use of hashtags on Twitter, you can broadcast and stay updated with events around the world. Not only that, Twitter can be used to monitor the latest trends. Hashtags make communications filterable and organized, which could be put to great use for getting feedback and suggestions. But there's more - you can take your research to the next level by using some great hashtag tracking and analytics tools! 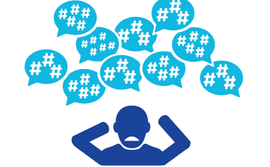 There are many powerful tools to effectively manage hashtags and make the most of them. Here are 5 of the best tools for making the most out of hashtags on Twitter. You can thing of Tagboard as the Pinterest of Hashtags. After you search for a hashtag, you are welcomed with a beautiful board, much like Pinterest, with updates from a wide range of networks like Twitter, Facebook, Google+, Instagram - networks that support hashtags. Not only can you track popular hashtags across all these platforms, you can also create your own hashtag to monitor. You can filter out conversations from networks that you’re not interested in. Tagboard offers a great way for discussions on a wide range of networks. Hashtagify is one of the best and recommended tool to start off searching hashtags. It not only helps you to find hashtags and tweets around them, but also draw out hashtags related to the one you have searched for. Hashtagify also helps you to find top influencers for each hashtag. The revenue model is based on a Freemium model and you have to pay for access to more of their services. But if you're a beginner, this is where you should start off. Tweetbinder is an amazing tool to help you analyse a twitter hashtag and see who all are engaged in the conversation, who is the most influential, what links where shared, etc. Similar to the word Hashtag itself, binder is meant to grouping similar things and conversations. Tweetbinder also shows the people in the that were the most active for a hashtag and who’s tweets got the most reach. You can also filter out the conversations to learn more about links shared, retweets and images. Then finally there is an overall analytics tool, which shows you the total tweets related to a conversation over a period of time, the retweets, the links etc. Twubs is another one of those best Twitter Hashtag tools out there. Twubs also features an auto-complete in their search toolbar that gives you more suggestions on the go as you type in. There is also an option to register your own hashtag with Twubs and have a personal landing page for the same. You could also host chat sessions with your audience from there. Apart from giving information about a hashtag, Twubs also acts as a Hashtag directory and Registry.